Well I earlier planned Ganesh ghat the easy route for Bhimashankar and conveyed this trek plan through email to all colleagues but finally only 3 people including me were ready hence after reaching Khandas,We decided that we will be using Shidi ghat to reach Bhimashankar and that day,it already rained early morning and weather was clear hence no possibility of heavy rains till we reach the top hence Shidi ghat was finalized and the easy Ganesh ghat route was cancelled. 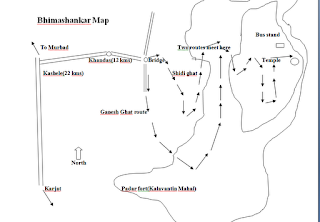 Also now I am looking to do Durg-Dhakoba trek soon.Reason because if I do this trek,There will be a record against my name of trekking each and every mountain continuos in Sahyadris right from Salher-Mulher-Mangi Tungi till Bhimashankar.Only Durga-Dhakoba near Darya ghat Junnar is remaining in between. 1) Ganesh ghat:It is an easy route but very very long route traversing the neighbouring Padar fort and reaching Bhimashankar upper Plateau.It takes 4 hours or more through Ganesh ghat.Through this route,from bridge after Khandas,take right and this route traverses through longer way and reaches a Ganesh temple.Further there is a well.From that well,take left towards Bhimashankar.Towards right,there is a tricky road to Padar fort from that well. 2) Shidi ghat:-It is a tough route but well defined one through steep climbs up and down,crossing ferocious rivers,waterfalls deep into the forests,climbing rocks and of-course ladders affixed into rockfaces.One has to be very cautious while going through this route and not recommended for beginners. We started the trek around 10:45 to 11:00 am from that bridge.The ganesh ghat route was crowded and noisy hence we decided to go through Shidi ghat.Hardly 5% of that crowd were going by Shidi ghat hence it was good one. Right from the start of that route,the steep climb welcomes you and in 30 minutes of walking,you encounter a waterfall in deep forests and a flowing river over waterfall. After crossing this river, again the steep climb continues and after 1 hour of trek is finished,you encounter the first ladder affixed in rock. After reaching here,you reach halfway mark.At this point,the route coming from Ganesh ghat meets the Shidi ghat route. This was the trek route.Somewhat difficult on the edges and on the ladders affixed in rock.Also some rock climbing was involved by this route. Thank you for this information. It has helped me in my trek planning - especially the reference map! beautiful information, gr8, keep it up man, god bless you!! 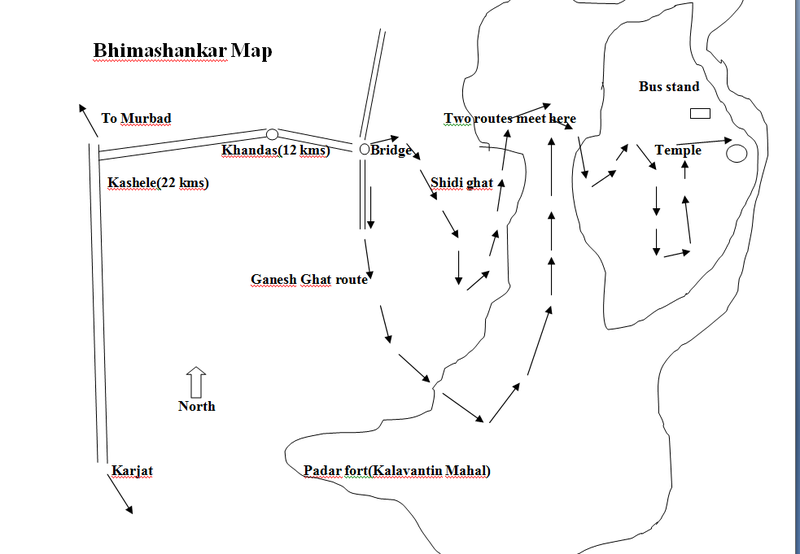 Book your Adventure trekking trip to Bheemashankar By logging into the Following Link. Enjoy this beautiful Journey .